Come Play a Role by joining us for this production. We look forward to seeing you! East versus West makes for a dramatic, richly textured and ultimately uplifting tale of enormous fascination. It is 1862 in Siam when an English widow, Anna Leonowens, and her young son arrive at the Royal Palace in Bangkok, having been summoned by the King to serve as tutor to his many children and wives. The King is largely considered to be a barbarian by those in the West, and he seeks Anna’s assistance in changing his image, if not his ways. With both keeping a firm grip on their respective traditions and values, Anna and the King grow to understand and, eventually, respect one another, in a truly unique love story. Along with the dazzling score, the incomparable Jerome Robbins ballet, ‘The Small House of Uncle Thomas,’ is one of the all-time marvels of the musical stage. Click here for information, or sign up for our email newsletter. 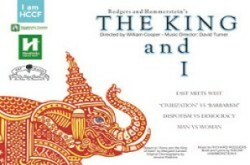 "The performance of The King and I surpassed our expectations by leaps and bounds!! It was a wonderful production and the cast was such an incredibly talented group of entertainers. Kudos to the entire team of individuals (both behind the scenes and on stage) who were responsible for providing such a CLASS ACT!! Thank you…we look forward to seeing future productions!"